You may have noticed a recent trend in the perception of the graduate and postdoctoral experience, be it in the state of our mental health; or perceived career goal of “academia-or-bust”; or maybe you’re just keeping your pulse on leading US academics warning of the imminent dangers of a flawed biomedical research system or the need for a fair deal for PhDs and postdocs? You’re certainly not alone – a group of postdocs in the Boston area are organizing the Future of Research symposium to be held October 2-3. The goal is for young scientists-in-training to come together, discuss aspirations for a better future for the scientific enterprise. We will have concerned scientists and policy-makers in attendance, including a message from Senator Elizabeth Warren, a keynote address from Henry Bourne, and panel discussions. Participants will also have the opportunity to give voice to their concerns through a variety of workshops focusing on important themes relevant to how we work, and how we will work. What are the themes of the workshops? – Do we reward certain approaches to science, and penalize others? – Do we ignore teaching in evaluating researchers? – How stable is the funding situation (focusing on the US) and how tenable? – Should there be a change to how funding is awarded in relation to training PhDs and postdocs? – How should graduate and postdoc training be done? – Is there too much focus on a career in academia and not enough on “alternative” careers? – Are PhDs in the US too long? – Do we have too many PhDs and postdocs? – Should lab sizes be limited? – Should we train more staff scientists and research associates and establish permanent, non-PI scientific positions? These are just some of the issues we could consider: please feel free to comment below or tweet to suggest more (also see below for ways to get involved). We also want to keep the issues of efficiency and competitiveness in our minds when discussing all these issues. For example, is it possible that a significant amount of funding is wasted by deliberate or unknowing competition? Can the scientific enterprise be improved by greater sharing of data earlier in the traditional publication process? And feel free to comment below; and spread the word amongst your colleagues, both within developmental biology and in other academic fields. We hope that this event will give us a basis to make a statement to the research community about the issues facing trainee scientists and academics, possibly with the production of a white paper. Therefore we hope to receive comments and feedback on what you think. In the build-up to the meeting, there will be a series of posts on different topics where again, we would be grateful for feedback and comments on your thoughts. 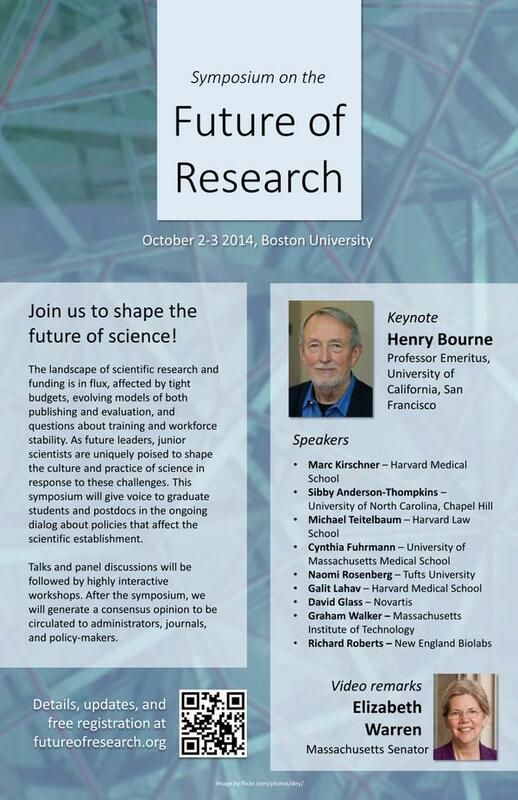 The Future of Research symposium will be held at Boston University October 2-3 2014.